The University of Massachusetts Student Government Association has elected a new speaker and associate speaker. Former Associate Speaker Rachel Ellis and SGA Senator Julia Fox ran unopposed for the roles of speaker and associate speaker, respectively. Fox was elected associate speaker with 31 out of 33 votes from the student government body, while Ellis was elected unanimously. Ellis, who joined the student government body in the 2017 academic year, said she has high expectations for members next year. “I expect commitment, and I expect drive and I expect motivation,” she said. Another one of Ellis’ goals as student speaker is to keep up with senators on new project ideas. “As time goes on, many of those projects get left in the dust or are not complete. I intend on keeping up with each and every one of you to make sure that no project idea ever goes to waste,” Ellis said. Additionally Ellis hopes to help unite the student government body, which has shown “divisiveness” during this election period. “Each one of you should feel as if you’re coming into a family, you should feel as if the people in this body surrounding support you and care about you,” she said. Fox also echoed Ellis’ call for unity in the student government body. Earlier in the meeting, the student government body passed a motion by the Club Sports Council to support the transition of club sports from the SGA to Campus Recreation. The Council hopes moving the program under Campus Recreation will help with the sustainability of the program. 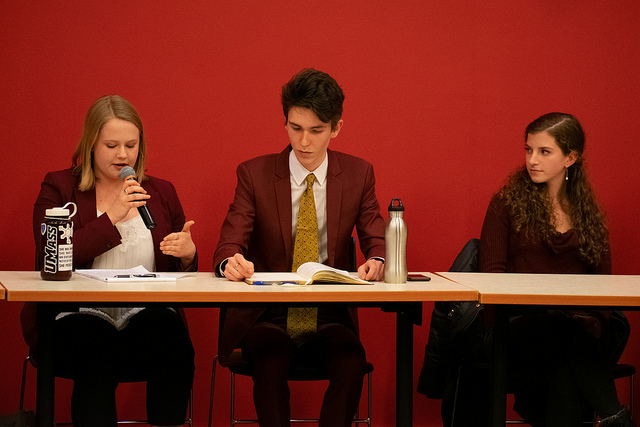 The move will also allow the SGA to fund more RSOs, because club sports currently take most of the budget, according to Allie McCandless, chair of the Ways and Means Committee. It is expected that the transition process will take about three years and be executed in phases to minimize disturbance to the clubs.